If you have little ones you will want to buy Christopher Robin because they enjoy watching it over and over again. You will also not be bored watching it along with them. In 1926 a collection of stories about a stuffed bear that came to life enthralled children everywhere. Written by A.A. Milne, the short stories became so popular that a second series was published two years later. From that time almost 100 years ago, millions of people worldwide have fallen in love with Winnie-the-Pooh (Jim Cummings; The Princess and the Frog), Eyeore (Brad Garrett; Everybody Loves Raymond), Tigger (Cummings), Piglet (Nick Mohammed; The Martian), Kanga (Sophie Okonedo; Hotel Rwanda), Roo (Sara Sheen), Rabbit (Peter Capaldi; Dr. Who) and Owl (Toby Jones; Tinker Tailor Soldier Spy). Numerous films have been made over the years and this year is no exception as Christopher Robin headed to movie theaters. As we closeout 2018, The live-action film hits stores for fans to buy and watch over and over again. We meet all of the beloved characters at their home in the Hundred Acre Woods as they sit down for a final meal with a young Christopher Robin (Orton O'Brien; Making Noise Quietly) as he plans to be sent away to boarding school. As they toast their friendship Pooh reminds Christopher Robin not to forget him. Fast forward 30 years to an adult Christopher Robin (Ewan McGregor; Moulin Rouge) working in an office for a suitcase manufacturer. He is a serious man who is so stressed that he has not only forgotten how to have fun but who has imposed his sadness onto his wife, Evelyn (Hayley Atwell; Agent Carter) and daughter, Madeline (Bronte Carmichael; On Chesil Beach). Suddenly when Winnie-the-Pooh shows up in London, a shocked Christopher Robin agrees to bring him home despite the fact that he has a major project to work on. As they travel back to the Hundred Acre Woods, Christopher Robins is suddenly reminded of what it is like to have fun and helps him to see the error of his ways. In the end, Christopher Robin learns to not take life so seriously and reconnects with his wife and daughter. McGregor is an excellent choice to play the adult Christopher Robin. He has an innate serious side but is able to tap into his inner child beautifully. He makes the character believable and not cartoonish or imbecilic at all. Atwell compliments him nicely and Carmichael rounds out the family nicely. The voice talents are also excellent especially Cummins as the voice of the beloved bear. His tonal inflection is warm and endearing and not at all annoying. The Blu-ray Combo pack has the Blu-ray disc, DVD disc, and Digital HD download. Its 1080p presentation is excellent especially when watching the CGI animated stuffed animals. Every hair on them movies independently for a realistic look. The DTS- HD Master Audio 7.1 is solid if non-spectacular. The extras are short but interesting. They Include: A Movie Is Made for Pooh, Pooh Finds His Voice, Pooh and Walt Become Friends, and Pooh and Friends Come to Life. The best of these features is Pooh Finds his Voice. Christopher Robin is a heartwarming tale with a strong cast, good story, and terrific CGI. Watching it you feel as though the toys really are alive and they certainly make the film special. Pooh is overtly philosophical while Eyeore is very funny. There is most definitely a moral to be learned but presented in such a way that is disarming as opposed to shoving it down the audiences' throats. If you have little ones you will want to buy this combo pack because they enjoy watching it over and over again. You will also not be bored watching it along with them. 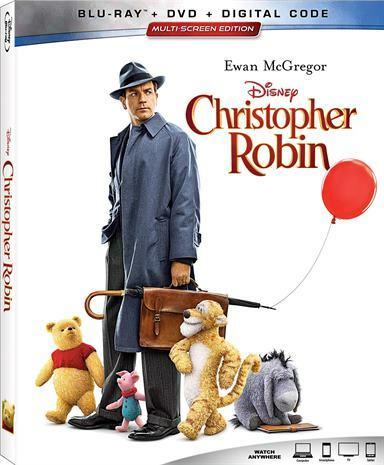 Download Christopher Robin from the iTunes Store in Digial HD. For more information about Christopher Robin visit the FlickDirect Movie Database.